In advance of the first date of the Vans Warped Tour® ’17 presented by Journeys® this week in Seattle, WA, Valiant Entertainment – the award-winning publisher of the largest independent superhero library in comics and The Keep A Breast Foundation – the leading global youth-based breast cancer prevention organization – are proud to unveil the next step in their ongoing partnership with an all-new, exclusive comic book starring Valiant’s renowned hero Faith! 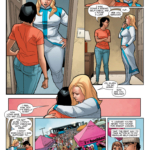 As detailed today at Womanista and ComicBook.com, the FAITH WARPED TOUR/KEEP A BREAST SPECIAL EDITION #1 features a brand-new, never-before-seen Faith story written by rising star Justine Prado (Finding Molly) with art by Valiant superstar Clayton Henry (ARCHER & ARMSTRONG) and Eisner Award nominee Kate Niemczyk (FAITH, Mockingbird). 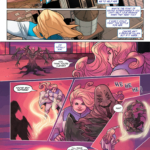 Get ready to meet Los Angeles’ leading superhero, Faith “Zephyr” Herbert, as she confronts the realities of breast cancer head-on in a special standalone story, created in collaboration with The Keep A Breast Foundation. Faith has saved her city from alien invaders and common criminals alike…but when a different, more personal kind of scourge hits close to home, can Faith show strength in the face of an all-too-common affliction that has affected millions of women and men around the world? Copies of the FAITH WARPED TOUR/KEEP A BREAST SPECIAL EDITION #1 will be available at select Vans Warped Tour® ’17 presented by Journeys® tour dates, beginning with an exclusive debut this Friday, June 16th in Seattle, WA. Additionally, fans worldwide can read this important new chapter in Faith’s ongoing adventures with free downloads courtesy of comiXology, the official Valiant mobile app for iOS, and The Keep A Breast Foundation website. 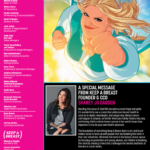 Since 2016, Valiant and The Keep A Breast Foundation have teamed their efforts in the form of an official partnership dedicated to furthering the California-based non-profit’s ongoing mission with new initiatives in educational publishing, fundraising merchandise, convention and exhibitions outreach around the world, and much more. In addition to the debut of the FAITH WARPED TOUR/KEEP A BREAST SPECIAL EDITION #1 – Valiant and Keep A Breast’s first full-length comics collaboration – Faith continues to serve as Keep A Breast’s “comics ambassador” and will continue to appear in a number of the foundation’s global promotional endeavors, both on the Vans Warped Tour® ’17 presented by Journeys® and around the world. The release of the FAITH WARPED TOUR/KEEP A BREAST SPECIAL EDITION #1 also marks Valiant’s latest exclusive addition to the publisher’s plans for the Vans Warped Tour® ’17 presented by Journeys®. Beginning this month, Valiant’s award-winning library of comic book superheroes will be hitting the road with America’s longest-running touring music festival for an immersive collaboration spanning the summer 2017 season. 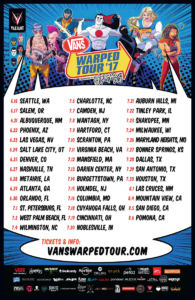 Together, this new partnership will be bringing the Valiant Universe of comic heroes – including Faith, X-O Manowar, Bloodshot, Livewire, Ninjak, and more – to posters, promotional pieces, merchandise, and more at over 40 Vans Warped Tour® ’17 presented by Journeys® tour dates across the United States. Created by former Marvel Editor-in-Chief Jim Shooter and Eisner Award-winning writer and artist David Lapham in Valiant’s acclaimed HARBINGER series in 1992, Faith has long been a central icon of Valiant’s award-winning publishing line. Then, in early 2016, Faith took her long-awaited, much-demanded first step toward solo stardom with FAITH #1 – a groundbreaking debut that quickly became the highest-selling superhero debut of 2016 from any independent publisher. In the time since, Faith’s adventures have garnered near-universal critical acclaim and attention from a host of international media outlets, including The Atlantic, Cosmopolitan, The Guardian, The Hollywood Reporter, The Huffington Post, The Independent, MTV, The New York Times, NPR, Nylon, PBS, People, Seventeen, Today, Vox, The Washington Post, and dozens more. Most recently, Faith’s ongoing series earned a 2017 Eisner Award nomination for “Best New Series” – one of the comic book industry’s most coveted and prestigious awards. Download a digital copy of the FAITH WARPED TOUR/KEEP A BREAST SPECIAL EDITION #1 now on comiXology, the official Valiant mobile app for iOS, and The Keep A Breast Foundation website, or pick it up the next stop on the Vans Warped Tour® ’17 presented by Journeys® – coming soon to a town near you! The Keep A Breast Foundation™ is a nonprofit organization with a mission to empower young people around the world with breast health education and support. Since its inception in 2000, KAB has worked with young people to remove the shame associated with breasts and breast cancer health. Through various initiatives and programs such as breast cast art exhibitions, the “Non Toxic Revolution”, “Check Yourself App” and “i love boobies!” campaign, KAB has opened up the dialog about breast cancer, and has proven to be a doorway to breast self-awareness and education. Keep A Breast has grown into the leading global youth-based breast cancer prevention organization, with global affiliates in Japan, Canada, Europe, and Mexico. Constantly pushing the boundaries of the pink ribbon status quo, Keep A Breast has always encouraged young people to love their boobies, get to know their bodies, and be aware of changes.